Meet A.C.E, a new boy group under Beat Interactive! 1. When A.C.E gave the striking busking performance in the best outfit ever. 2. wHEN THEY CAN PULL off RED PANTS LIKE NO OTHER. Let's admit it - they look good in any outfit. 3. When A.C.E once again mesmerized people in Hongdae through BTS "Not Today" cover. Look at all the people who gathered around to watch the boys dance! 4. When they have the best model poses ever. Let's just take a second to appreciate their perfect model poses. Who wouldn't want to take a photo with them? 5. When they make the cutest human tower for a photo. 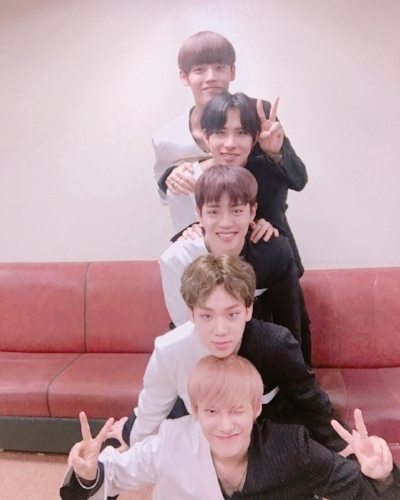 Nothing is sweeter than seeing members so close to one another~ <3 LONG LIVE A.C.E!